End EU free trade talks with Morocco regarding Western Sahara! This petition has been created by Sara E. and may not represent the views of the Avaaz community. We call on the EU to abide by the judgment of its own Supreme Court, and to cease all trade talks regarding Western Sahara with the occupying state, Morocco. As a champion for rule of law and human rights, the EU should respect the rights of the Saharawi people and negotiate trade in goods from Western Sahara with their representatives, the Polisario Front. The European Commission is negotiating a revised EU-Morocco Agreement that would allow the EU to continue importing goods from Western Sahara. Western Sahara, a territory the size of the United Kingdom, is treated by the UN as an unresolved colonial conflict, stemming from the time that Morocco illegally annexed parts of the former Spanish colony more than 40 years ago. Half the people live as refugees, while Moroccan settlers have outnumbered the local Saharawis. The EU wishes to import Western Sahara products (such as fish and agriculture products) through its trade deal with Morocco. 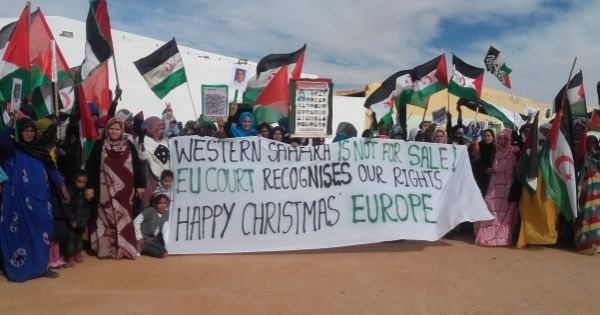 In December 2016, the Court of Justice of the European Union (CJEU) ruled that no EU trade or association deal with Morocco can be applied to Western Sahara, as it is a “distinct and separate territory” from Morocco, unless with the express consent of “the people of Western Sahara”. 3) seeking some Moroccan institution or body to provide the consent of the “population”. If so, the EU’s response to the landmark ruling of the CJEU on Western Sahara would fail to uphold the fundamental rights of the Saharawi people, undermine the EU’s credibility as a law-abiding regional block and create legal uncertainty for European businesses. We believe that the rights and the future of the Saharawi people and the fundamental tenets of the European legal order, which concern all Europeans, cannot be brushed aside merely for the geopolitical and commercial interests of a few. The EU needs to respect EU and international law, and abide by the judgment of the EU Court of Justice. Morocco has no mandate to negotiate with the EU on behalf of the people of Western Sahara. Together, we can send the EU a strong signal that the days of trade over people are finished. Sign up!